Python Insider: Python Core Development Sprint 2016: 3.6 and beyond! Python Core Development Sprint 2016: 3.6 and beyond! 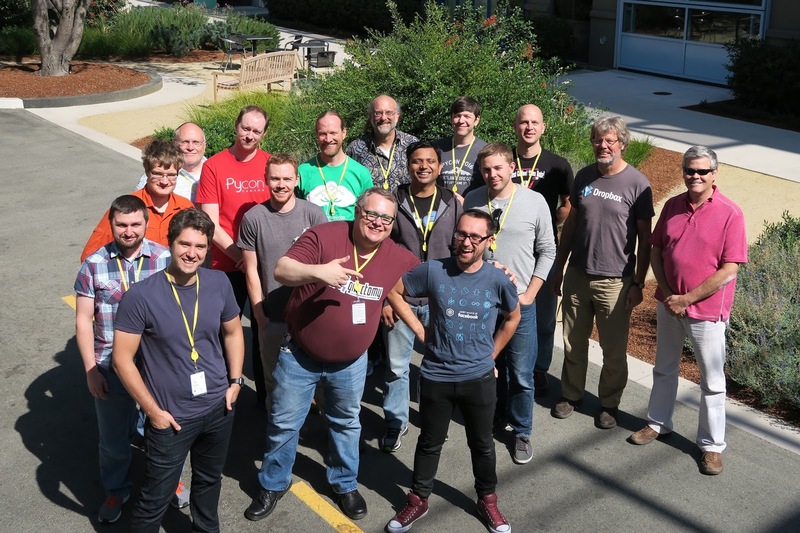 From September 5th to the 9th a group of Python core developers gathered for a sprint hosted at Instagram and sponsored by Instagram, Microsoft, and the Python Software Foundation. The goal was to spend a week working towards the Python 3.6b1 release, just in time for the Python 3.6 feature freeze on Monday, September 12, 2016. The inspiration for this sprint was the Need for Speed sprint held in Iceland a decade ago, where many performance improvements were made to Python 2.5. How time flies! From a quantitative perspective, the sprint was the most productive week for Python ever! According to the graphs from the GitHub mirror of CPython, the week of September 4th saw more commits than the preceding 7 weeks combined! And in terms of issues, the number of open issues dropped by 62 with a total of 166 issues closed. Some large projects were also worked on that are not represented as PEPs. For instance, Python 3.6 now contains support for DTrace and SystemTap. This will give people more tools to introspect and monitor Python. See the HOWTO for usage instructions and examples showing some of the new possibilities. CPython also gained a more memory efficient dictionary implementation at the sprint. The new implementation shrinks memory usage of dictionaries by about 25% and also preserves insertion order, without speed penalties. Based on a proposal by Raymond Hettinger, the patch was written by INADA Naoki prior to the sprint but it was reviewed and heavily discussed at the sprint, as changing the underlying implementation of dictionaries can have profound implications on Python itself. In the end, the patch was accepted, directly allowing for PEP 468 to be accepted and simplifying PEP 520. Work was also done on the Gilectomy (see the presentation on the topic from PyCon US for more background info on the project). Progress was made such that Python would run without any reference counting turned on (i.e. Python turned into a huge memory leak). Work then was started on trying the latest design on how to turn reference counting back on in a way that would allow Python to scale with the number of threads and CPU cores used. There’s still a long road ahead before the Gilectomy will be ready to merge though, and we even jokingly considered branding the result as Python 4. Much of the work done during the sprint led not only to improvements in the language and library, but to better performance as well. A quick performance comparison between Python 3.5.2+ and 3.6b1+ under OS X shows that 3.6 is generally faster, with double-digit speed improvements not uncommon. Similar benchmarking under Windows 10 has been reported to show similar performance gains. Special thanks to Łukasz for making the event happen and to Larry for designing the logo.